Whenever I get to the final book in a series, I'm excited to see how it concludes, and also sad that the story is ending. 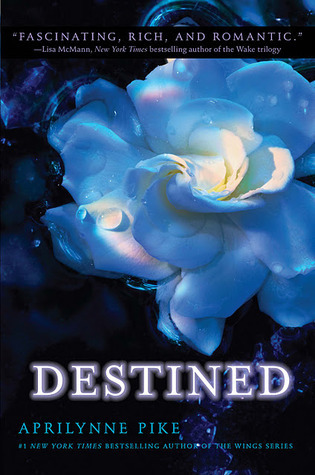 It's important that a final book is a strong finish to the series, and DESTINED is exactly that! Aprilynne Pike has done a marvelous job of finishing this story. This is a must for any WINGS fan. DESTINED was a huge change of pace from the rest of the series -- the events all take place mainly in one day. And what an eventful day it is. It's jam-packed with action and adventure. Avalon is at stake, and Laurel and Crew must fight to keep it safe. The fight scenes were done wonderfully; Aprilynne Pike has such great way with words. I could clearly see everything in my mind while it was happening. There are also lots of parts told from Tamani's point of view, which I loved. It was awesome to see his perspective on the events going on. I'm going to avoid saying too much because I don't want to give spoilers, but I was happy to find that Laurel ended up with the guy I was rooting for. I find that in love triangles I sometimes root for the guy who gets shafted at the end, and I was so happy to find that this wasn't the case with this series. I am so happy that DESTINED ended the way it did -- I feel like this decision was right for Laurel from the beginning, and I'm glad she finally realized it. I also loved the epilogue at the end -- it was very realistic and well-done. Kudos to Aprilynne Pike for such a great series! I can't wait to see what she has in store for us next.